For more details on study of Mormons and Mormonism as an academic field, see Mormon studies. The Encyclopedia of Mormonism is a semiofficial encyclopedia for topics relevant to The Church of Jesus Christ of Latter-day Saints (LDS Church, see also "Mormon"). The text is available free online. Published in 1992, the Encyclopedia contains nearly 1500 articles, including several short unattributed entries (the equivalent of Wikipedia stubs) in four volumes. The text is approximately one million words, and over 1,850 pages including pictures, maps, charts, index, and appendices. The title for the Encyclopedia of Mormonism was chosen by Macmillan, the secular publisher that initiated the project. There were over 730 contributors from a wide variety of fields, most of whom had LDS and academic backgrounds. A large number were professors at Brigham Young University (BYU), the LDS Church-owned university. Most individuals contributed only one article, and few submitted more than three or four. Notable contributors include Mormon historians Leonard J. Arrington and Thomas G. Alexander, former Salt Lake City mayor Ted Wilson, noted non-Mormon LDS historian Jan Shipps, authors Steven R. Covey, Gerald N. Lund, and Richard Eyre, respected scholar and apologist Hugh Nibley, and a few members of LDS hierarchy such as H. David Burton and Jeffery R. Holland. The editor of the Encyclopedia of Mormonism, Daniel H. Ludlow, states that he strove to make the volume as professional as possible. Most articles are written by Ph.D.s in their respective fields. LDS general authorities (the spiritual leaders of the church) wrote little of the Encyclopedia; indeed, most contributors from church hierarchy were only tapped to write articles on the publications or institutions they directly administered or led. For impartiality and perspective, several non-Mormons were asked to write important articles. For example, Shipps wrote on the outsider's interpretation of Mormonism, and Richard P. Howard, a historian of the Reorganized Church of Jesus Christ of Latter Day Saints (now the Community of Christ), wrote on his branch of the Latter Day Saint movement. The Encyclopedia of Mormonism includes lengthy articles on core LDS subjects like LDS Church history and doctrine, but the work also includes many topics that are less closely related to Mormonism. For example, articles on constitutional law, sports, science, and feeedom discuss LDS perspectives and contributions to various fields. Ludlow also sought to make the encyclopedia accessible to non-Mormons: an optional fifth volume was printed, containing the "Standard Works," LDS scriptures that are heavily cited in the encyclopedia. Lest the role of the Encyclopedia be given more weight than it deserves, the editors make it clear that those who have written and edited have only tried to explain their understanding of Church history, doctrines, and procedures; their statement and opinions remain their own. 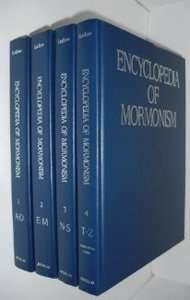 The Encyclopedia of Mormonism is a joint product of Brigham Young University and Macmillan Publishing Company, and its contents do not necessarily represent the official position of The Church of Jesus Christ of Latter-day Saints. – Encyclopedia of Mormonism, p. lxii. The LDS Church also noted the position in official publications. In spite of these comments and the non-Mormon publisher, the Encyclopedia is referred to as an official or at least semiofficial publication by many outsiders of the church. The view has credence because BYU was the contractual author of the work. Furthermore, six general authorities, not credited editors, worked on the project, including Dallin H. Oaks, Neal A. Maxwell, and Holland (BYU president when the project began). In addition to established scholars like Nibley, many other LDS scholars who were then less known also contributed, including John Gee, William Hamblin, Louis C. Midgley, Daniel C. Peterson, Noel B. Reynolds, Stephen D. Ricks, John L. Sorenson, Melvin J. Thorne, and John W. Welch. Critics had mixed reviews. Sterling M. McMurrin said that "the articles on social issues and church structure and the biographies are the most useful" but also felt that "the work is a carefully sanitized partisan affair that, while having many strengths, is quite uneven in quality and, though it appears to face many difficult issues head on, clearly omits, distorts, and compromises wherever necessary to advance and protect a positive image of Mormons, Mormonism, and the church." George D. Smith concluded his review of the Encyclopedia by saying, "As a 'religious encyclopedia' that addresses a goal of preserving a body of belief, the Encyclopedia of Mormonism impressively fulfills its mission. At the same time, the encyclopedia, like an iceberg, presents only a portion of important background and issues concerning the Book of Mormon. It is a brief for orthodoxy that lacks the scope and diversity necessary to qualify it as truly encyclopedic." The introduction to Sunstone's review of the Encyclopedia mentioned that Lavina Fielding Anderson "pointed out 'pitfalls in the treatment of women's issues, but revealed a few surprisingly positive moments that otherwise might have been overlooked-and probably were by some editors.'" No article of so-called Mormon historical revisionism is found in the Encyclopedia. It has been noted that after the Encyclopedia's publication, several LDS scholars were excommunicated, including some members of the 1993 "September Six." George D. Smith criticized the Encyclopedia because it is not the promised comprehensive treatment of Book of Mormon scholarship: "it is a statement of LDS orthodoxy." ↑ Editors (November 1993). "Evaluating the Encyclopedia of Mormonism: Introduction" (PDF). Sunstone (92): 31. Archived from the original (PDF) on 2014-08-15. Ludlow, Daniel H, ed. (1992), Encyclopedia of Mormonism, New York: Macmillan Publishing, ISBN 0-02-879602-0, OCLC 24502140 . McMurrin, Sterling M (1993), "'Toward Intellectual Anarchy,' review of Encyclopedia of Mormonism", Dialogue: A Journal of Mormon Thought, 26 (2) . Midgley, Louis (2004), "The Signature Books Saga", The FARMS Review, Provo, Utah: Maxwell Institute, 16 (1), retrieved 2014-02-03 . Smith, George D (November 1993), "Orthodoxy and Encyclopedia: The Book of Mormon in the Encyclopedia" (PDF), Sunstone (92): 48–53 .